The Puma infantry fighting vehicle (IFV) is the latest German combat vehicle; it entered service in 2014. It has been claimed to be one of the most advanced and the most protected IFV in the service, based on the relatively huge combat weight of up to 43 metric tons in the maximum armor configuration. Only the T-15 Aramta IFV at about 45 metric tons, which was revealed at a later point of time, seems to have comparable or better armor protection in certain areas (but apparently it's unmanned turret is rather poorly protected). This post, originally made in slightly modified form in a forum, but I decided to post here about the topic with a bit further details added. Due to lack of motiviations, a lot of work for my job and other reasons I failed to meet my plans with this blog in the last month(s), so here is this rather speculative piece, just posted in order to not end with only one or two post per months this time. I'd like to note that all photographs used in this article are available to the public and no classified information has been used. The Puma can uses a modular armor approach, where the protection can be adjusted according to the threat level. This also enables the Puma to remain air-transportable via the Airbus A400M aircraft, while being higher protected than other vehicles: for each three Pumas transported with a A400M aircraft, a fourth carrying the modular armor packages is required. Furthermore the modular armor allows replacing damaged sections much easier, a design that has been used on some applique armor kits for military vehicles since the 1990s. The weight of a Puma ranges from about 31.5 metric tons to up to 43 metric tons in the heavy combat configuration with all-round protection against medium calibre rounds and RPGs. Side armor without ERA, parts of the ceramic applique armor have been dismanteled. The hull side armor of a Puma hull consists of steel, onto which up to two layers of applique armor are mounted via shock-absorbing bolts. These two layers of passive armor, most probably ceramic composite armor. 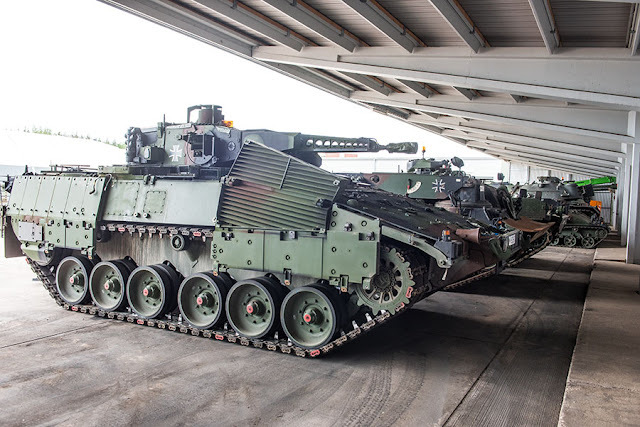 According to Rheinmetall Chempro, one armor manufacturing subsidiary of the German company Rheinmetall, the Puma IFV utilizes AMAP-B among other types of armor. AMAP-B is composite armor designed by IBD Deisenroth, which offers up to four times as much protection per weight against kinetic energy projectiles as conventional and high-hardness armor steel. The light and medium versions of AMAP-B, designed to offer protection in accordance with STANAG 4569 level 1 to 6, are utilizing nano-metric high-hardness steel and nano-ceramics. These are modern materials with modified microstructure (in case of ceramics, the grain size is less than a micrometre and hence in the margin of nanometres), which results in higher hardness and less shattering upon repeated impact of armor-piercing ammunition. Based on the appearance and protection requirements, the Puma's side armor modules are most likely nano-ceramics glued onto a flexible aramid backing covered with a splinter foil or steel plate. The ceramics appear to be supplied by CeramTec-ETEC GmbH. It is possible that just one of the two passive armor layers is required for protection against 14.5 mm AP ammunition and the second layer is part of the additional armor for protection against medium calibre ammunition. 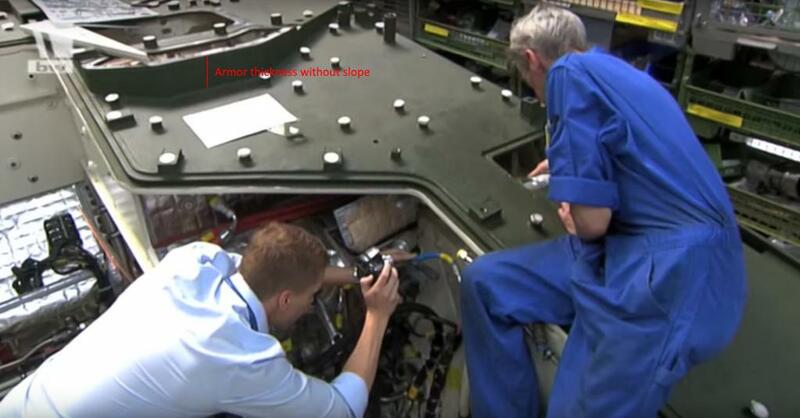 Against which calibre exactly the Puma's armor is meant to provide protection is unknown, but it is at least resistant to 30 mm APFSDS rounds according to statements from the manufacturer. Rumors suppose that the actual level of protection is noteworthy higher. The engine vent is also fitted with an additional armor module, which is made of sloped and spaced metal plates (presuambly high-hardness armor steel is used instead of non-ballistic mild steel). During it's development the Puma's hull side armor has gone through four or five iterations. Originally on all of the initial five prototypes it consisted only of thick passive composite armor. When the production of the first proper pre-production/low-rate intial production vehicles was announced, the Puma instead used another type of passive armor with greater thickness and a more box-shaped appeareance. These vehicles also featured slat armor extending further to the center of the roadwheels. Then there were two versions which seemed to be using explosive reactive armor (ERA) only. The final configuration utilizes ERA at the upper portions, passive armor in the center and slat armor in the lowest sections (i.e. to the roadwheels). The rear section of the vehicle is also covered by slat armor. The Composite Lightweight Adaptable Reactive Armour (CLARA) ERA is supplied by Dynamit Nobel Defence (DND) and uses fibre-composite plates without any metal content, in order to reduce the danger for nearby infantry of being hit by deadly metal fragments. According to an interview with the head of business development of Dynamit Nobel Defence, the ERA provides at least ten times the protection per weight as "conventional armor" (which probably is meant to be normal armor steel), but cannot defeat tandem warheads on it's own. Based on DND's patents, it might be a multi-layered ERA construction using two reactive layers and a passive one. There have been light and heavy versions of the CLARA ERA; apparently the Puma uses the heavy one based on the thickness and weight of the ERA tiles. This also uses Ultrax plates from Verseidag Indutex, a company which might be part of Rheinmetall Verseidag nowadays, to protect against 30 mm APFSDS and explosively formed penetrators (EFPs). 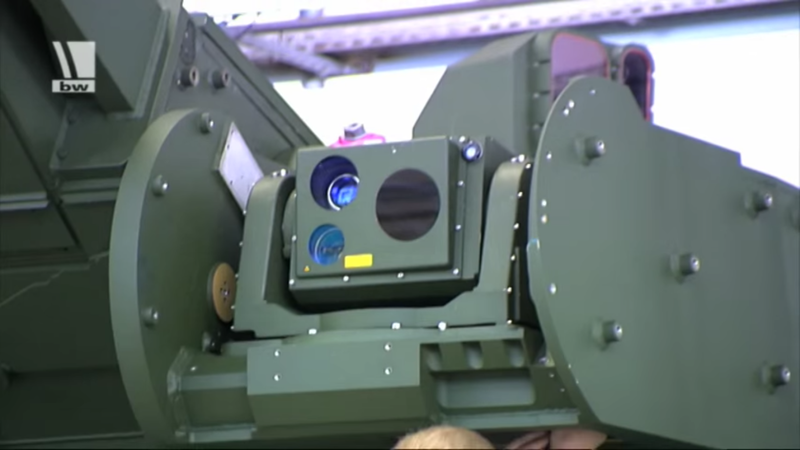 The Puma's remote controlled turret is made from aluminium plates, which are welded together. The aluminium has to be welded a constant temperature, which suggests that they are using a more advanced alloy than the standard aluminium 5083 alloy used on the M113 and M2 Bradley. The 5083 alloy offers essentially no weight savings over steel, requiring in some cases more than three times the thickness of steel armor for the same protection level. The company Aleris claims that it supplied aluminium armor for the production of the Puma's prototypes in it's defence brochures; given that the brochure is older, from a time when the series production had not started, it seems plausible that Aleris also supplied the aluminium alloy armor for the final production models of the Puma. Possible alloys that are manufactured by Aleris and could have been used for the Puma turret include the AA 2519 and AA 7039 aluminium armor alloys, which both offer a weight saving of 15 to 20 percent over the 5059 aluminium for the same level of armor protection. Alloy 5059 aluminium already offers a major increase in armor protection over the old 5083 alloys. 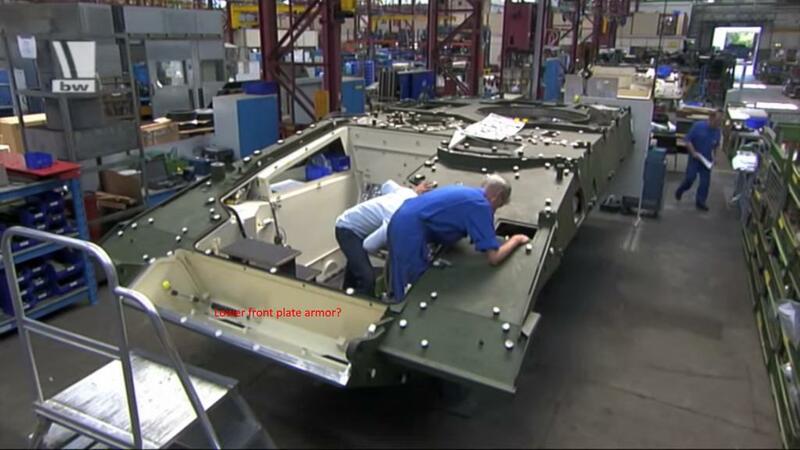 Further plates of AMAP-B composite armor are mounted upon the aluminium turret base construction. For protection against 14.5 mm AP ammunition only a single plate is used, but a further layer of composite applique modules can be mounted for protection against 30 mm ammunition. The Puma glacis armor seems to consists of a highly sloped layer of non-explosive reactive armor (NERA), aswell as composite armor modules bolted on the steel hull. The NERA layer is spaced above the main composite armor. NERA usually consists of two metal (steel, aluminium or titanium) layers with a confined/compressed layer of an elastic material such as rubber sandwiched inbetween. Upon impact, the rubber will expand and the armor will bulge. This is highly effective against shaped charge jets, which are used on rocket-propelled grenades (RPGs) and anti-tank guided missiles (ATGMs). The bulging moves more material into the path of penetration and has a disruptive effect, which will weaken the shaped charge jet. Only one NERA layer can be seen on the available photographs, but in theory there could be multiple spaced layers. Most likely the Puma's NERA doesn't utilize dumb rubber, but a modern composite material. In research papers a material made by IBD was tested for application on NERA, which reduced the penetration of a ATGM to only 15 to 22 milimetres, while the same armor array using an elastomer (such as rubber) reduced the penetration to 107 mm in the worst case only. According to Rheinmetall Chempro and IBD Deisenroth Engineering, the Puma IFV is fitted with AMAP-SC composite armor, which provides between 8 and 10 times as much protection per weight against shaped charges than conventional armor steel. The composite armor modules bolted on the hull below the NERA most likely utilize nano-ceramics as well. According to Professor Richard Ogorkiewicz, who worked as Defence Scientific Advisory Council for the British Ministry of Defence, ceramic armor provides more than twice as much protection as steel against shaped charges. The Puma hull is made from steel. Welding and bending the steel plates together took four months on the initial models (pre-production or low-rate initial production). 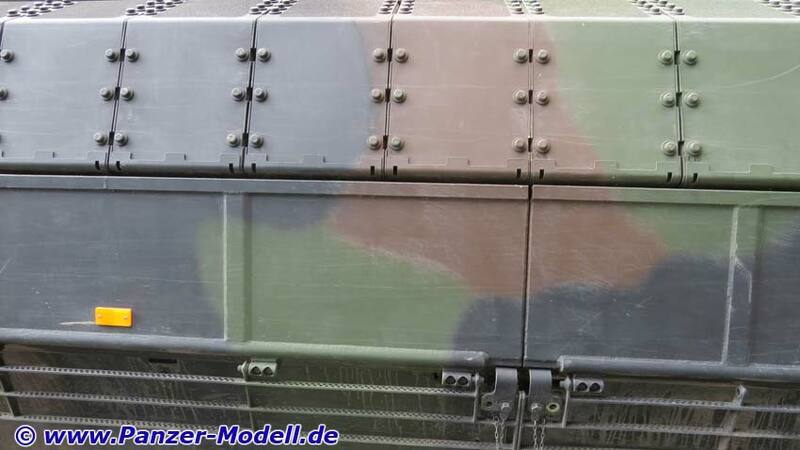 Parts of the hull are constructed with the "Dünnblech-Biegetechnologie" (thin metal bending technology), which also has been used on the Boxer multi-role armored vehicle. Instead of using multiple steel plates and welding them together, the plates are rather bend. This allows to use thinner steel plates (increasing the weight efficiency when fitted with composite armor) and creates less weak-spots and breaking points against AP ammunition and shock blasts such created by mines and improvised explosive devices (IEDs). 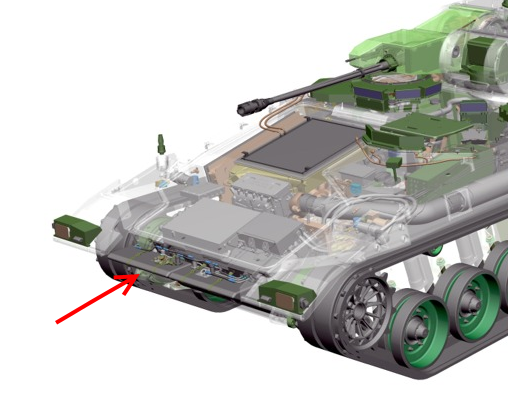 The lower hull compartment houses some components for the drivetrain/transmission/etc., but based on some older CAD graphic, this only covers the uppermost part. It is quite thick and has enough space for advanced armor arrays consisting of multiple NERA panels and ceramic layers. 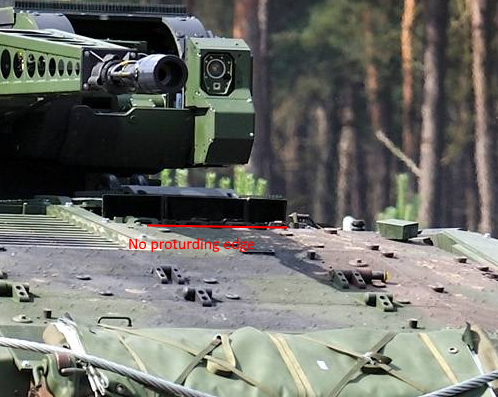 The actual thickness of the Puma frontal hull armor (without slope) can be seen at the photo above. On the completed vehicles, the vision blocks of the driver extrude from the glacis, the steel edge in the photograph is not visible. The Puma's frontal hull is protected against medium calibre ammunition (such as 30 mm APFSDS rounds), explosively formed penetrators (EFPs) aswell as RPGs with shaped charge warheads. Accounting the slope, there should be considerably more than 300 mm of space for armor. Although it should be noted that probably about half of this might be empty space required for the disruptive effect of the NERA to kick in. 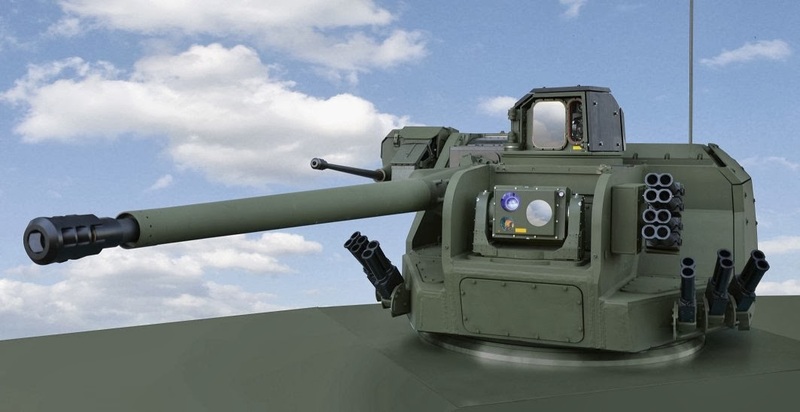 The basic Puma turret provides all-round protection against 14.5 mm AP rounds from heavy-machine guns and anti-materiel rifles. 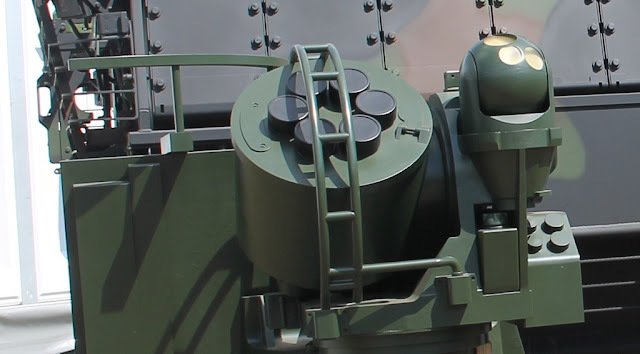 The Puma turret can be fitted with additional armor to provide protection against medium calibre ammunition, larger fragments of artillery rounds and large artillery bomblets with EFP or shaped charge warhead. 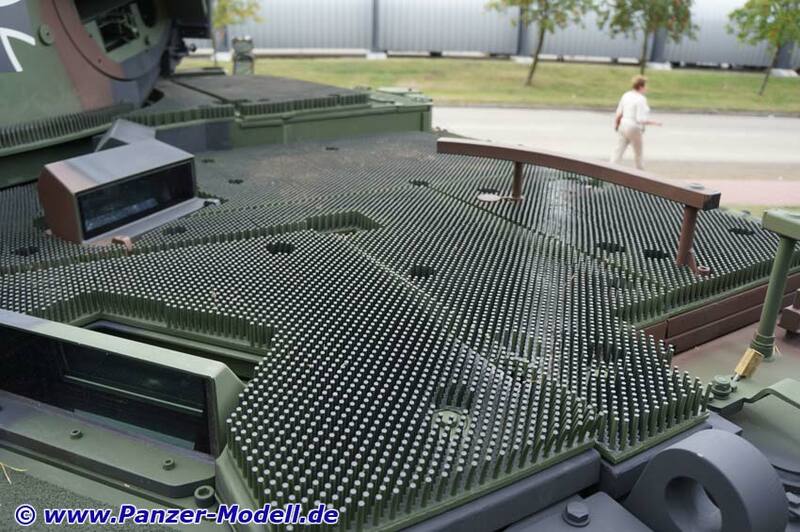 Except for a smaller curved section behind the gun (which moves when the gun is elevating), the add-on armor for the roof consists of "Igelpanzerung" (hedgehog armor), which utilizes many rubber-spikes to damage the shaped charge warheads of artillery bomblets. 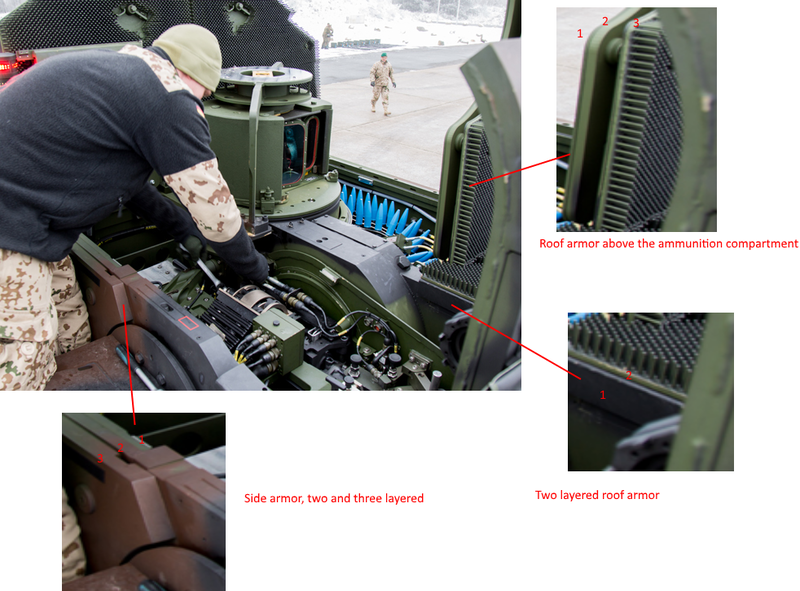 Below the bomblets there is additional passive armor on same cases (supposedly ceramic armor), while the hedgehog armor above the ammunition compartment is spaced for some unknown reason. Above the crew positions the roof armor appears to consists of thicker composite plates or two thinner ones. Artillery submunitions with shaped charge warhead can penetrate more than 200 mm of armor steel. Most likely the Puma is currently the best protected IFV in active service; depending on exact armor thickness and composition, the T-15 Armata might rival or beat the Puma in terms of protection. The Puma comes with a higher protection level than any infantry fighting vehicle currently in service. For protection against ATGMs the Puma is fitted with the MUSS active protection system, that is being trialed in the United Kingdom for adoption on the Challenger 2 and other combat vehicles. Specifically the protection of the roof section, something often overseen when upgrading older vehicles, is not rivaled by existing vehicles. Still the Puma falls short on the requirements from the original NGP development (which later was cut and modified to the Puma), which called for a modularily reconfigurable vehicle with modular armor package and a weight ranging from 51 to 77 metric tons depending on armor package. The NGP demanded heavier-than-MBT protection for the MBT and IFV variants. The Puma still needs to be fitted with the MELLS multi-role missile launching system for the Spike-LR ATGM, but there have been numerous delays with it (beginning with the original missile failing to meet the German requirements for accuracy during the first series of trials, then the launcher had issues and now the budget is used for other things). The TSWA turret-independent secondary-armament still needs to be fitted, but it has been modified in the past year; the original design saw the usage of six 76 mm grenades (lethal and non-lethal) with a relatively short range; the system has been extended by a ring containing about 24 low-velocity and medium-velocity 40 mm grenades with air-burst capability. Furthermore there are other upgrade plans. There is a tender for replacing the 5.56 mm MG4 machine gun with a 7.62 mm MG; apparently Heckler & Koch (MG5) and Rheinmetall (with the three-barreled RMG 7.62) are interested in the contract. The Puma also should be fitted with a situational awareness system, probably Rheinmetall's SAS 360 system. Furthermore there are plans for enhancing the computer system, allowing to operate unmanned ground vehicles (UGVs). Shephardmedia wrote in this regard: "The aim is to have operation of UGVs integrated into the vehicles." It is not entirely clear what this means. Will is be possible to convert the Puma to an UGV? Is a modified version of the Puma used to operate multiple UGVs, by using the dismount compartment to house the equipment and seats for several UGV operators? Or will every Puma (while still being a somewhat conventional IFV) be capable of operating one or multiple UGVs? In the latter case one has to wonder who would operate the UGV when the infantry is dismounted: the gunner, commander or driver all have their own tasks to do. Interestingly the Puma is being offered to Australia for the Phase 3 stage of the LAND 400 program with the upgrade option to the larger and 50% more powerful 35 x 228 mm calibre. It is not known if they would keep the Puma's unmanned turret, but modify it's interior or utilize a completely new turret. Krauss-Maffei Wegmann has developed the IWS-35 remote weapon station using the same optronics as on the Puma IFV, which is fitted with a 35 mm Bushmaster III chain gun and a 0.50 cal heavy machine gun as coaxial armament. The externally-powered Bushmaster III can be upgunned to use 50 mm "SuperShot" ammunition, by replacing the gun barrel and a few other parts. If the optional Puma configuration offered to Australia is using the IWS-35 with the Bushmaster III gun, it would be quite ironical, as the original German requirement for the NGP infantry fighting vehicle called for a 50 mm calibre gun.